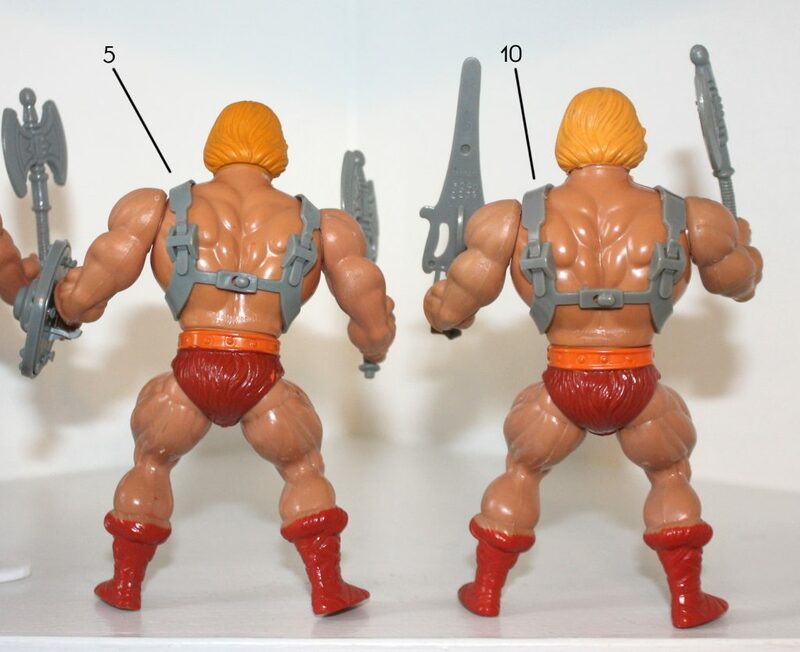 Because Masters of the Universe figures were produced over many years in a number of different countries, there is no shortage of production variants, some subtly different and some radically different from the norm. In my own collecting, I’ve always gravitated toward the earliest figures released in the US, particularly for the first wave of figures. They tend to have the nicest paint and plastic applications, in my opinion. 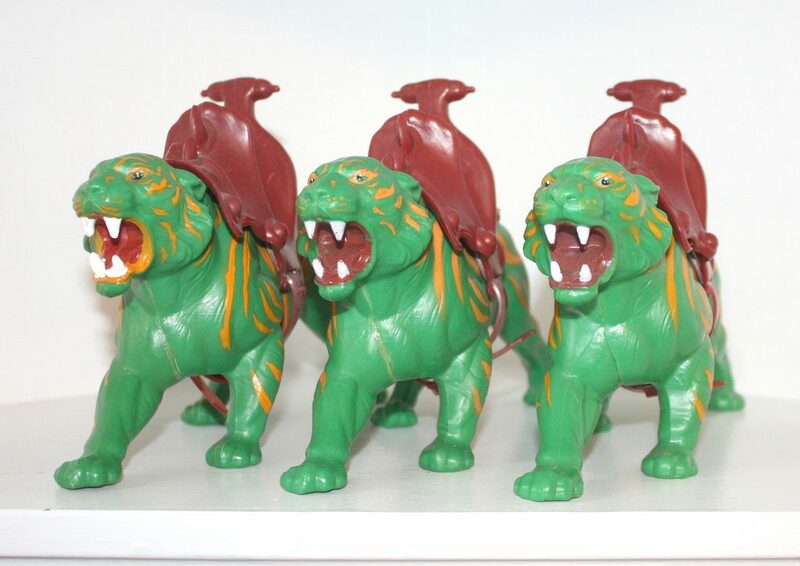 All of the 1982 lineup was manufactured in Taiwan, except for Castle Grayskull, Battle Ram and Wind Raider, which were initially manufactured in the US. Much assistance for this article was given by Unsung Woodworks, who runs the Lords of Power blog on Facebook. The research of Mantisaur82 and Tokyonever has also been invaluable. 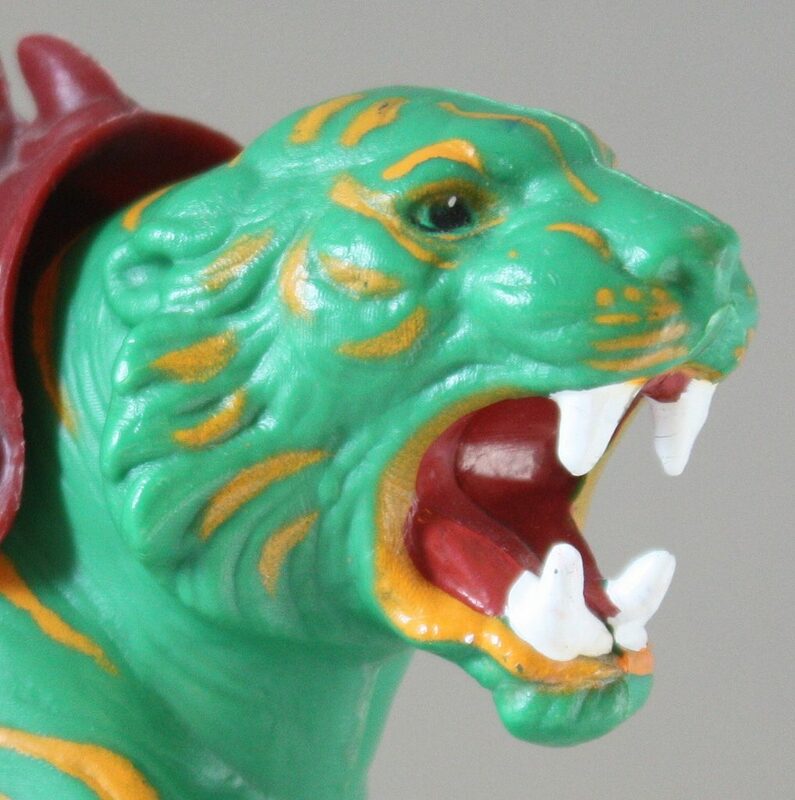 The early Taiwan figures tend to have the sharpest detail and the finest paint applications compared to later reissues. Subsequent releases tend to cut down on the paint applications and sometimes on the sculpted detail. 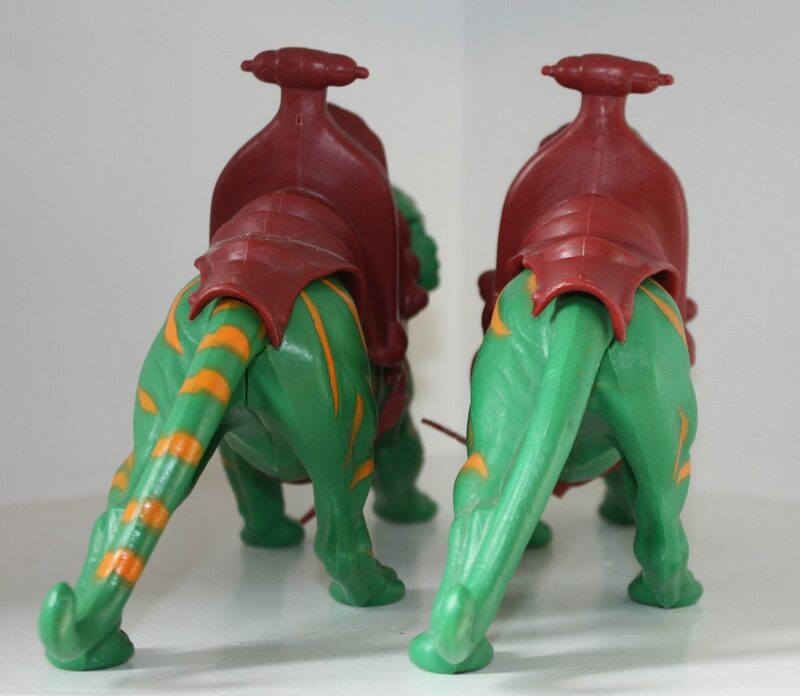 The earliest figures tend to have boots that are painted on using spray paint and a paint mask, which sometimes shows up as unevenness at the boot tops. Later figures seem to use a dipping method. Since this seems to apply to all the early figures (or at least those with painted boots), I won’t mention this when I talk about each individual figure. 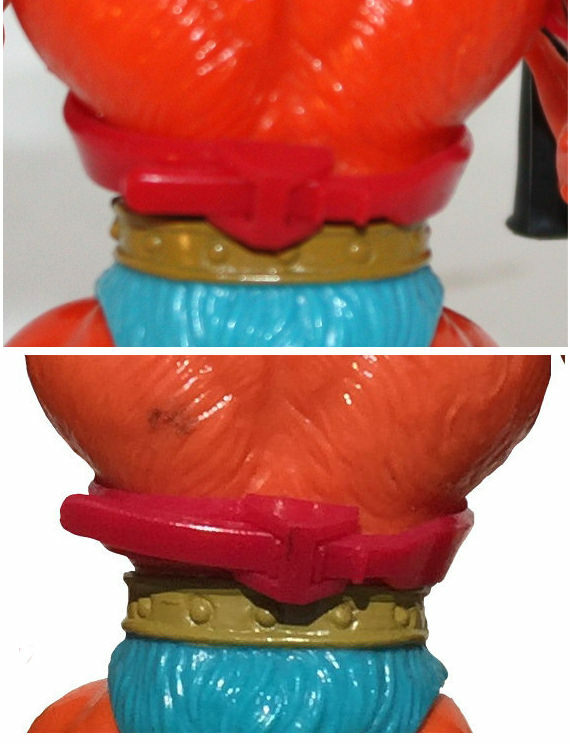 On the lower backs of the figures (or in Teela’s case, the lower part of the back of the head) they are stamped © Mattel Inc. 1981 Taiwan. This stamp can also be found on the undersides of the male heads. 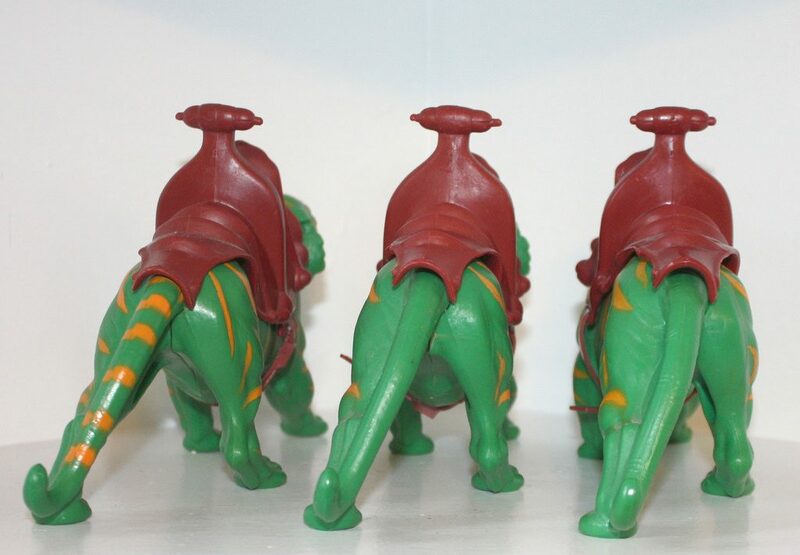 These figure were released in 1982, but most MOTU figures are stamped the year before they were sold in stores, when the tooling was being created. However, as these Taiwan figures were released in subsequent years, they often retain the 1981 date, albeit sometimes with a slightly larger font. The very first versions of He-Man tend to have a certain coloring – dark orange belt (later versions could range from light orange to mustard yellow to coral), brick-red boots and loin cloth, and dark gray accessories. 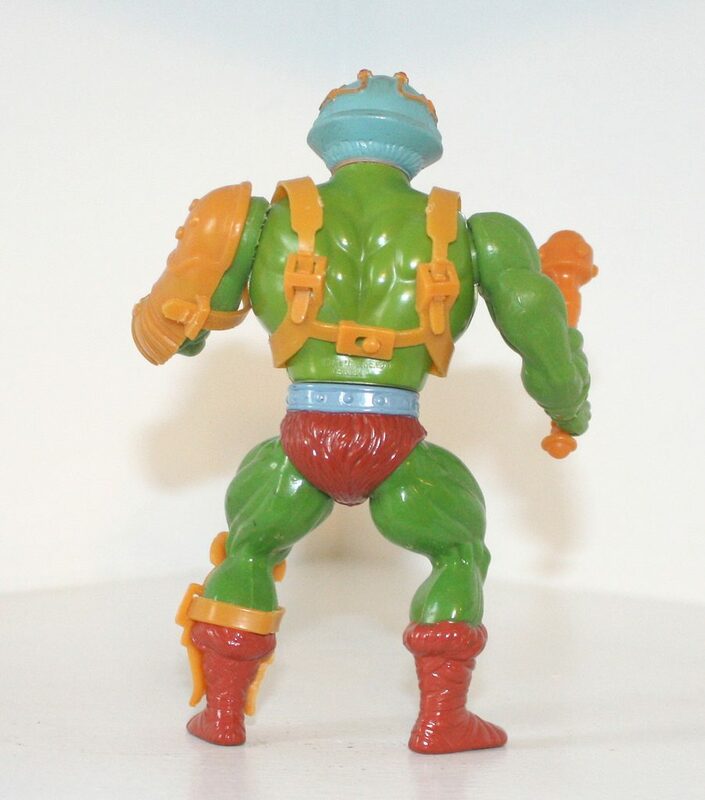 He has a belly button, which was eventually removed from the mold starting in 1983 (although some 1983 figures seem to still have it). Some of the early accessories seem to be slightly blue-tinged. The straps on the back of his harness have short tabs on them – they were lengthened in subsequent releases to make it easier for children to hold when putting the armor on. Early versions seem to have a tighter fitting latch in back as well, and intense yellow hair. It’s very common to see the boots not painted all the way up to the top in these early figures. If they are painted all the way to the top, there is usually some uneven overspray in some areas regardless. 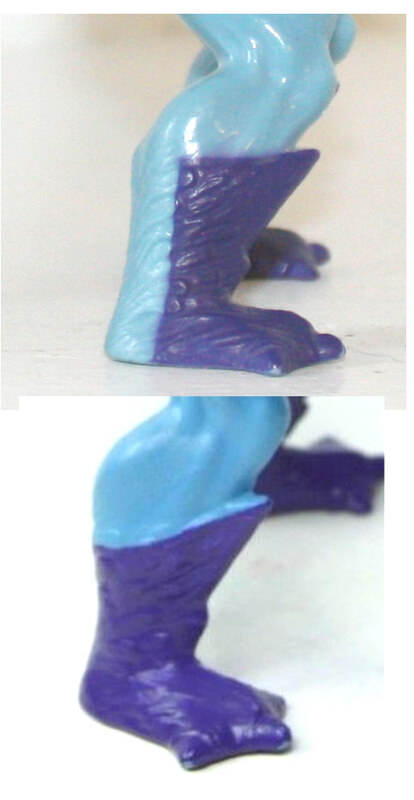 Later figures have the boot color applied by dipping the legs in paint. Hair: the early figures’ hair seems to be intense yellow, almost orange tinged. Slightly later in year the hair starts to be a lighter yellow color. I’ve found two main types of paint used – a glossy textured kind of paint, and a non-textured paint that seems almost like a dye. 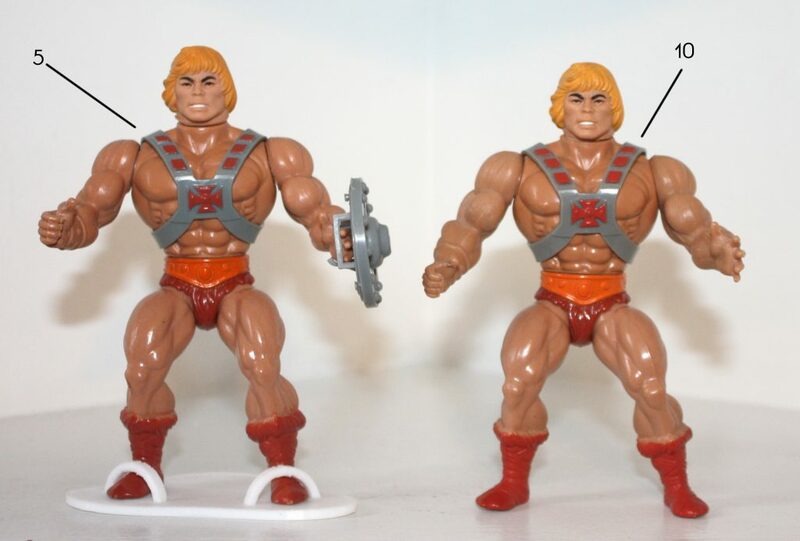 Two very early He-Man figures. The example on the right has the textured, glossy paint. I think both were used concurrently. Belt: the earliest ones are dark orange. 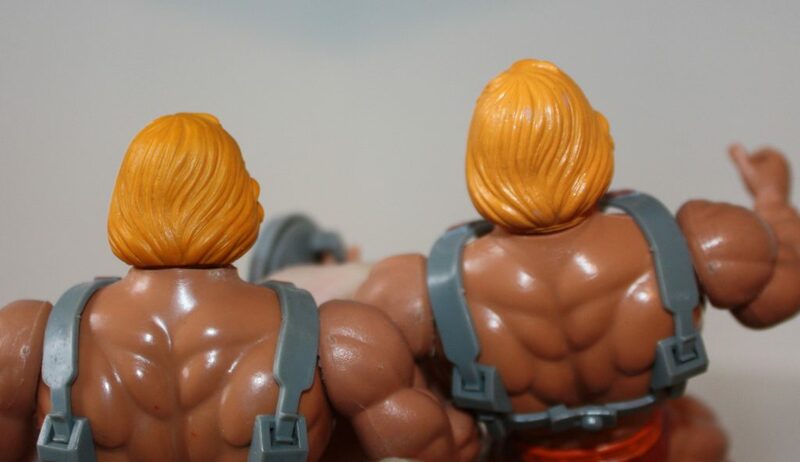 The color is a bit lighter as you get later in the year, for instance on carded 8-back He-Man figures that have the warranty information added. 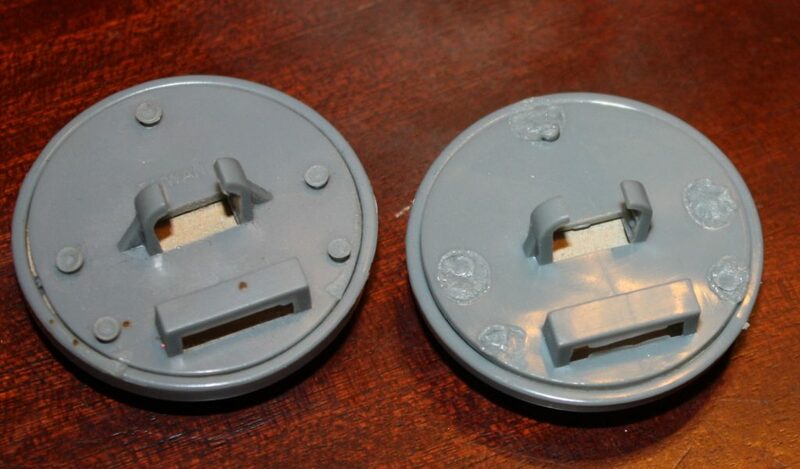 Belly Button: the earliest ones (sold on 8 backs without warranty) are a bit uneven looking. By the time you get to the 8-backs with warranty, the belly button looks anatomically correct. 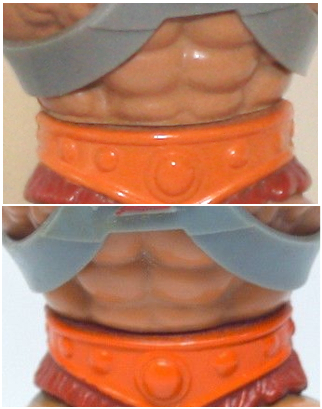 From left to right, you can see as the figures get later, the belt gets lighter and the belly button becomes more anatomical. Waist Punch Feature: the earliest versions have a stopper, so when you twist the waist, it swings back to punch, but stops in the middle. A bit later in the year that stopper was removed, so the punch action doesn’t stop quite in the middle, but keeps moving a bit beyond that. 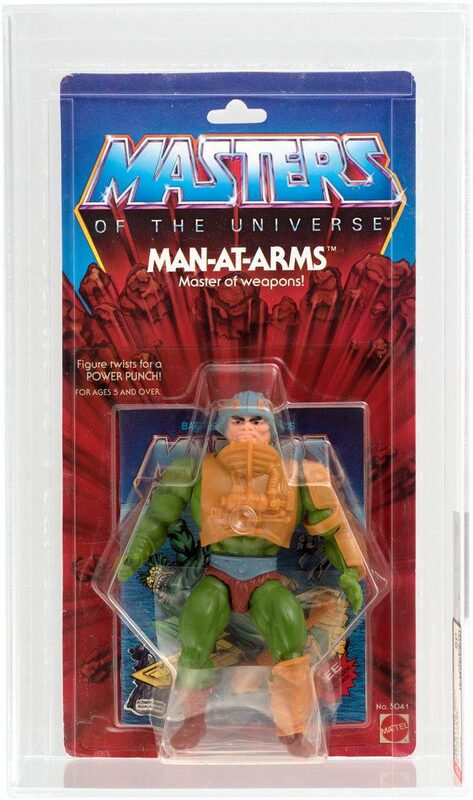 This is also evident in early Skeletor figures, and possibly Man-At-Arms and Beast Man as well. Sword: the early ones seem to be marked 4 or 9. The earlier numbered swords tend to be a darker blue/gray color, although you can look at many examples and few will be the exact same shade. Axe: the early ones are marked 2 or 7. The earlier numbered axes tend to be a darker blue/gray color, although you can look at many examples and none will be the exact same shade. Harness: the early ones are marked 5 or 10. The 5s I’ve seen seem to be a dark gray/blue, with small oval tab on the latch in back. The 10s seem to have more of a almost multi-hue gray plastic, slightly brighter red paint, and a slightly elongated tab on the back. Both have short straps, and both seem to appear very early, although the 10s seem to persist later in the year. 15s look very similar to 10s and come later still. I should say that I believe sometimes accessories with the markings outlined above did persist later than early 1982. In general, however, the trend seems to be for the numbers to go higher with time. I’ve seen numbers as high as 33 on later figures. Shield: Early ones are marked Taiwan. The tabs on the back should be more or less intact. Slightly melted at the top, but not completely melted to the back of the shield, as happened later in production. The exact shade of gray varies quite a bit. Early shields look like the example on the left. 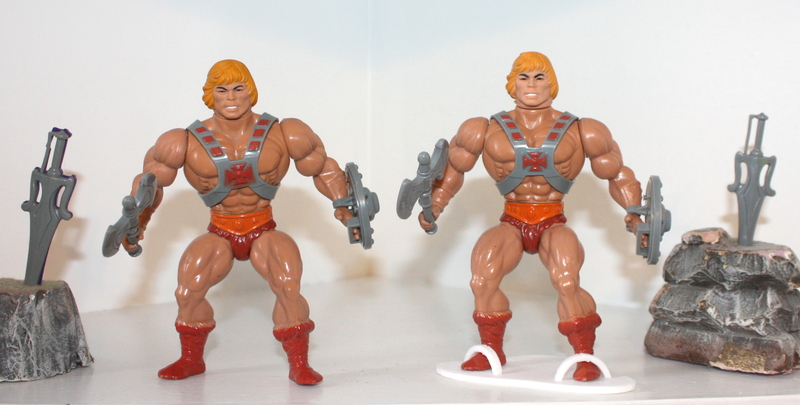 Here are some examples of four early He-Man figures. The two figures on the left are the earliest, although I couldn’t say which came first. The figure second from the right came later in the year (it lacks the stopper in the waist punch feature), and the one on the far right came later still. 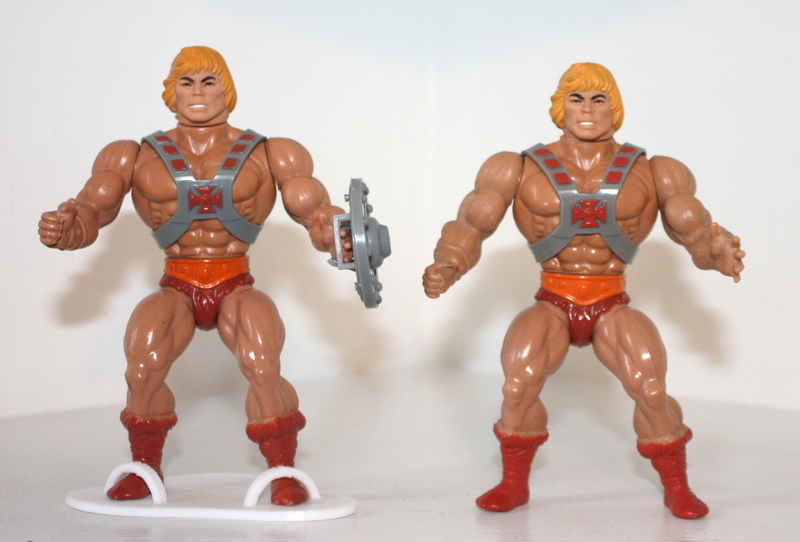 And here are my two earliest Taiwan He-Man examples (below, and above on the left). Both have harnesses marked 5. The one on the left has some overspray on the chest emblem, which isn’t too uncommon. The one on the left also has weapons with the earlier number markings, and they are slightly darker gray/blue. 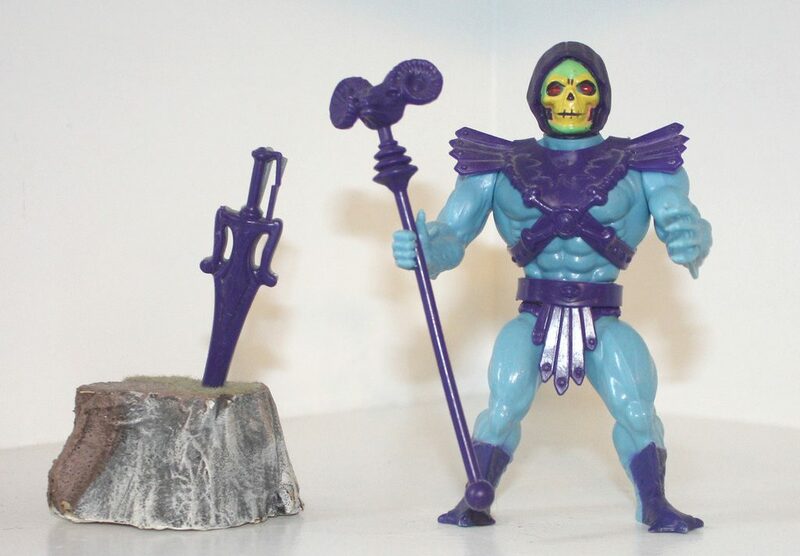 The early Skeletor’s staff is marked Taiwan, and his sword is also marked simply as Taiwan (later versions of the sword add some code numbers on the underside as well). This early example has rather brittle accessories, so I won’t remove them to discover what codes are under his chest armor and belt. 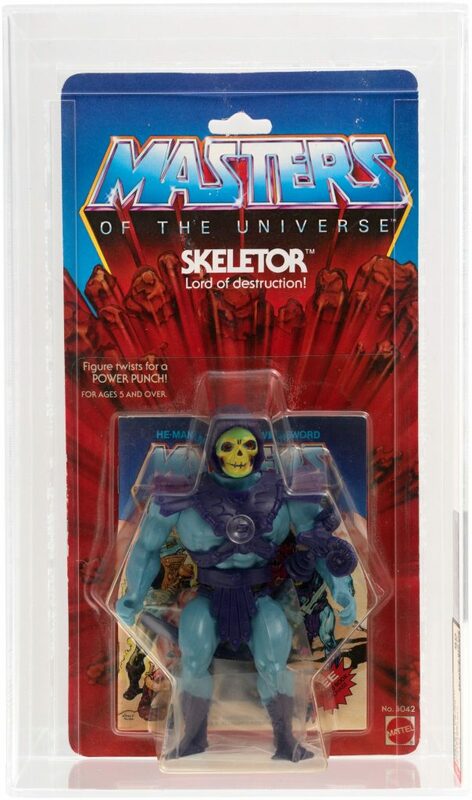 Here is an example of a very early carded Taiwan Skeletor, which can be recognized by the lack of warranty and lack of SKU/character subtitles on the back. There are at least three distinct very early Taiwan Battle Cats. 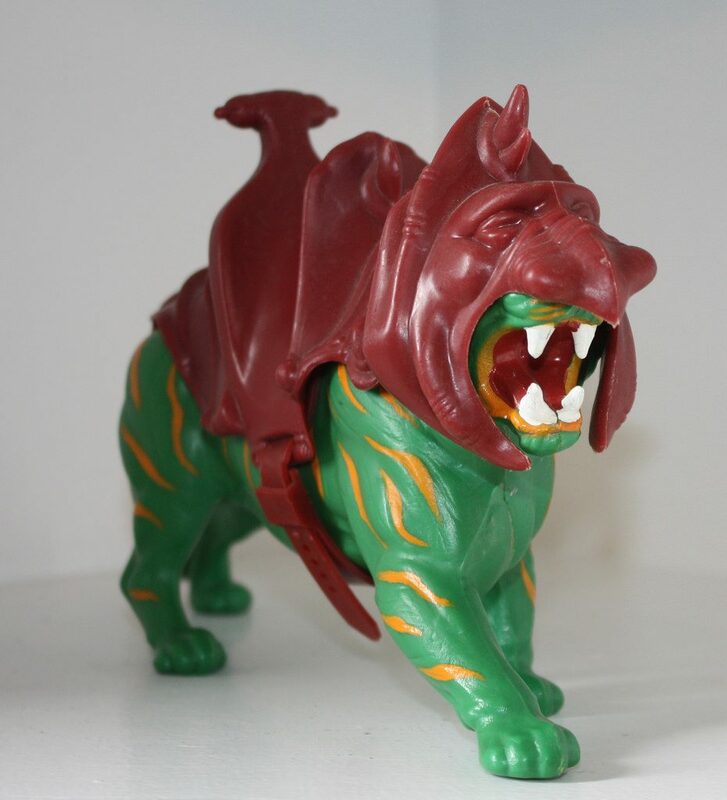 You can spot this variant in early catalog pictures of MOTU figures. These seem to be production samples rather than figures that were sold to the public. 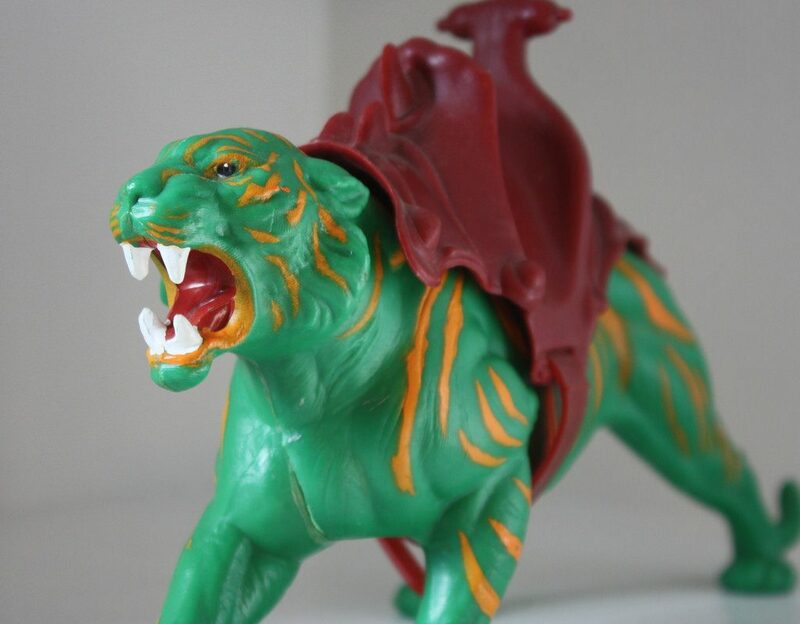 The orange lines on this cat match the black lines on the original Big Jim Tiger the figure is based on. It also has finely textured fur (difficult to see unless it’s in hand), again like the Big Jim Tiger. 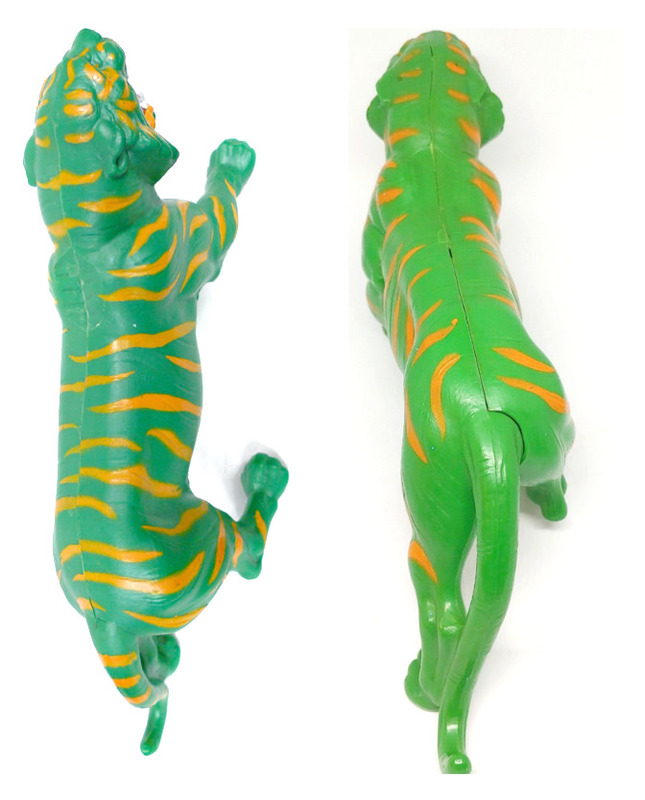 Striped tail paint pattern (left) crosses over the back, while the more common Battle Cat paint pattern (right) does not. Left image is from Tokyonever. Thanks to Unsung Woodworks for pointing this out. 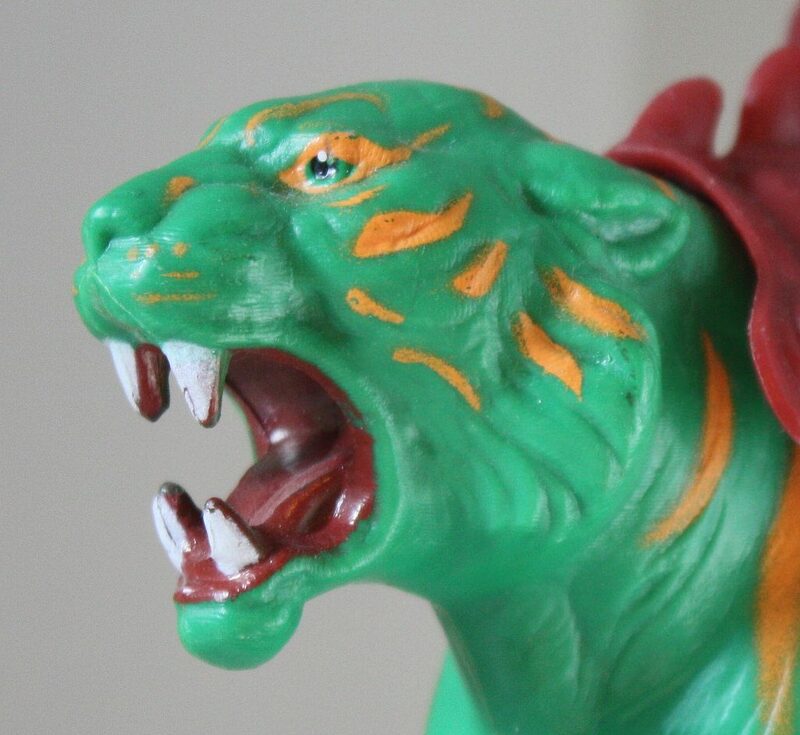 The first mass-produced version of the Taiwan Battle Cat retains the textured “fur” of the first sample version (and the Big Jim Tiger), but omits the extra orange paint applications on the mouth and tail. The teeth are also only painted white from the front. 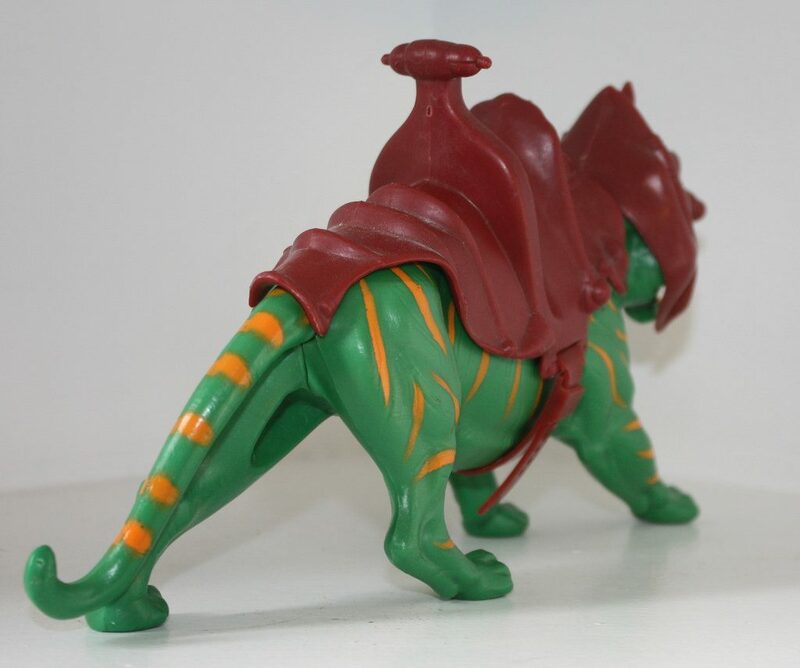 Like the rare striped tail model, it is marked © Mattel, Inc. 1976 Taiwan. It also is marked “1” underneath the saddle and helmet. The next incarnation of the early Taiwan Battle Cat is missing the texture from V1 and V2. It’s marked © Mattel, Inc. 1978 Taiwan. It also is marked “1” underneath the saddle and helmet, and retains the white dots in the eyes. The orange paint is somewhat lighter than previous versions. My particular example came from a damaged early 1982 Battle Cat box featuring only the 1982 cross sell art on the back. It also seems to have a brighter red saddle and helmet, although this doesn’t necessarily come across in the photos below. 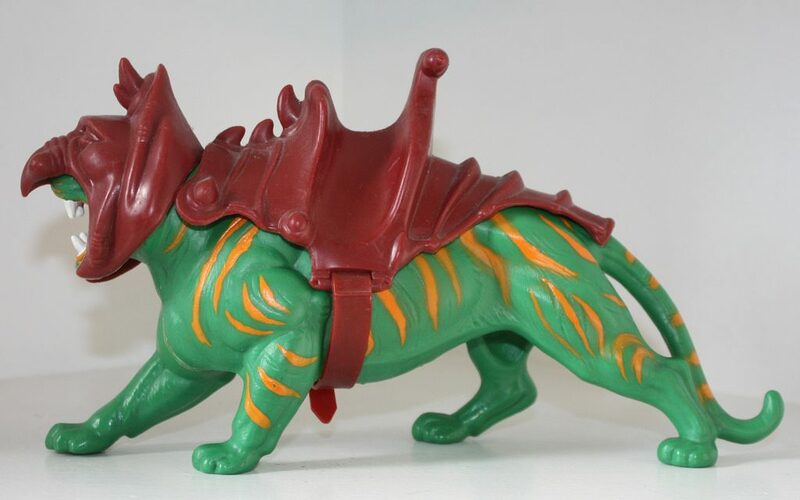 I’m not sure if the textured version was more likely to come in either the single Battle Cat box or the early He-Man/Battle Cat gift sets – it’s difficult to tell with mint in box examples whether or not the texture is present. 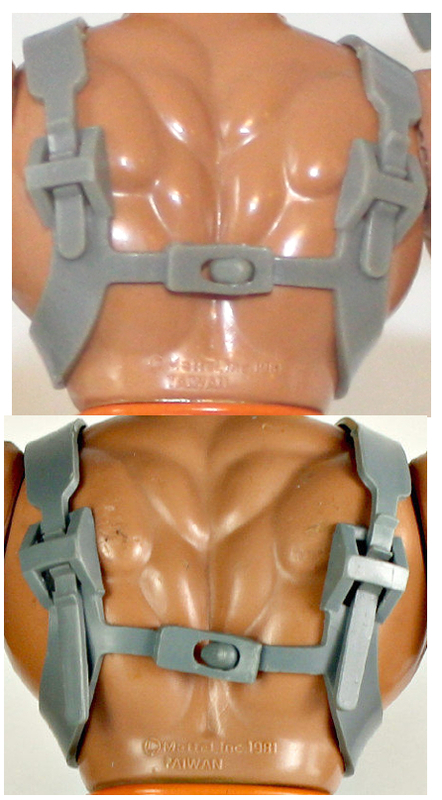 On the example below, the chest armor is marked 5041-2289A © Mattel Inc. 1981. All the other accessories are unmarked. The next Taiwan releases omitted the red dots, and have longer straps at the back of the armor. Later Taiwan releases feature a gray belt and much darker colors all around, and a helmet that is somewhat teal-colored. 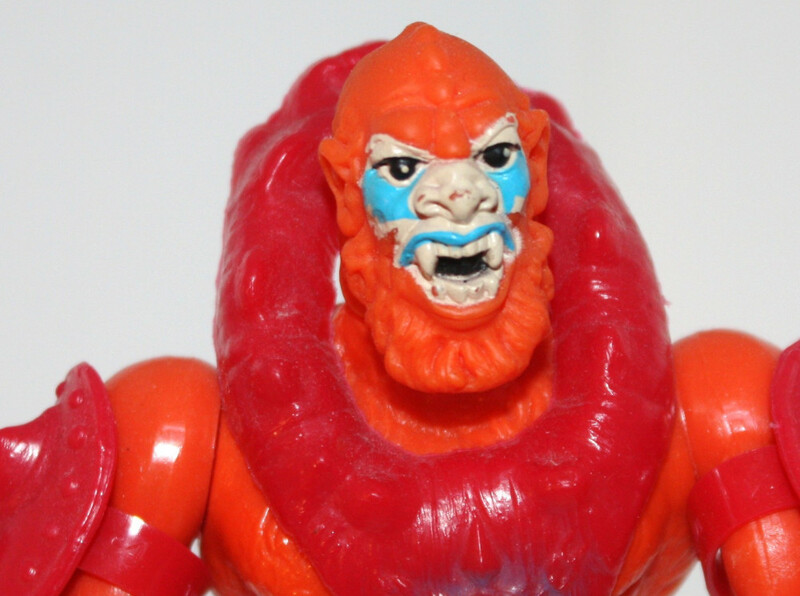 Early Taiwan Beast Man figures aren’t dramatically different from later versions. The most obvious differences are that the first versions have white dots in the eyes, and a short strap around the back of the armor. 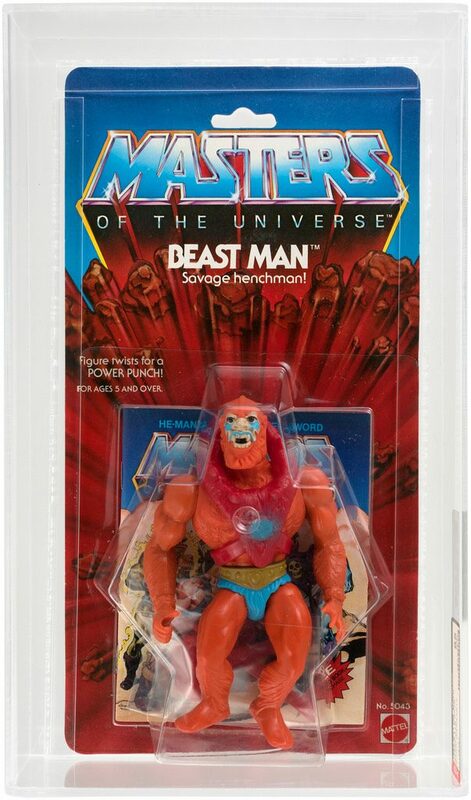 However, here is an example of a very early carded Taiwan Beast Man, which can be recognized by the lack of warranty and lack of SKU/character subtitles on the back. I’m not totally sure if this one has dots or not. I see what could be gray dots, but they could also be reflected light. 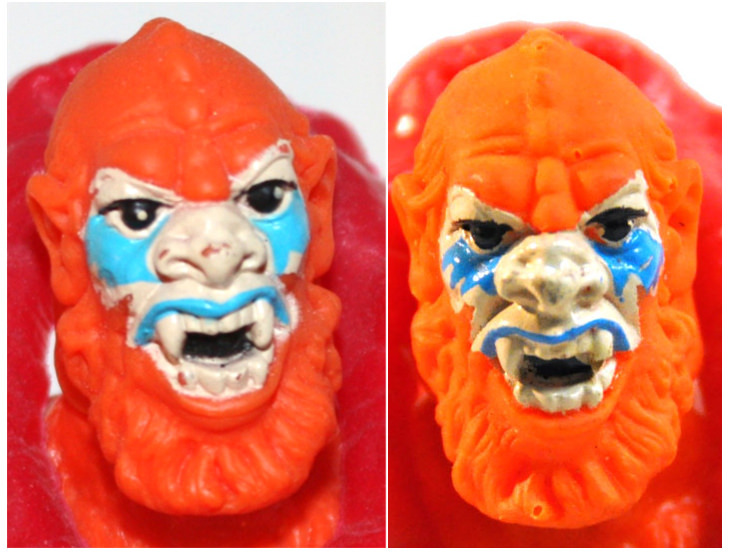 It’s possible that Beast Man started out without the dots, then dots were added early on, and removed in later versions. I’ll keep searching for more carded first editions and update this article if I find anything new. 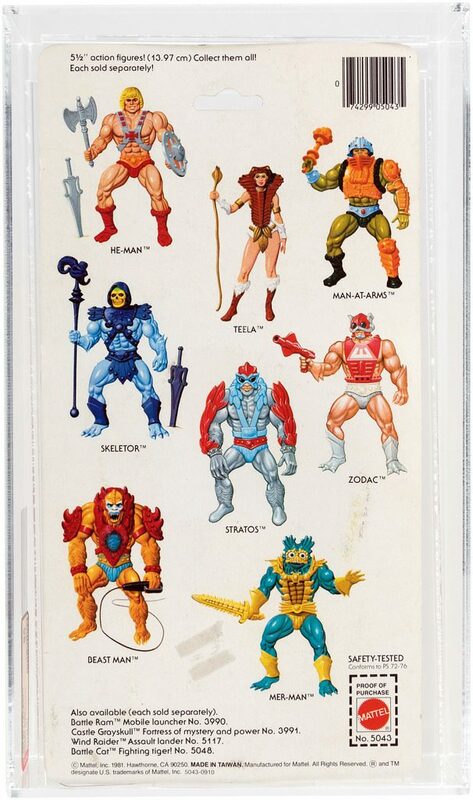 Covered in part two: Stratos, Mer-Man, Teela, Zodac, Castle Grayskull, Battle Ram and Wind Raider. What a great topic and so well researched, just what I want to read. Looking forward to the next part! I’ll point out that for the most part (but not always) some of the smoothing and loss of finer detail is mould degrading. Even steel moulds, the more you use them, the more they start to degrade in various ways. sometimes they loose detail, get clogged up with mould release and bits of loose plastic, some can lead to increasing facial changes (one known to transformer fans is G1 Jazz. By the time it was reissued in 1991 (after the 1984 issue), the mouth had changed from a static pose, to more of a upset pose. when it got reissued later on around early 2000s, the mouth now appeared as an open gasp before the head mould was remade for later issues. loosing of joints is also another common issue with such toys because the require precise lengths and tolerances for there intended use. Also, as you have mentioned before, a retool often meant changing the mould physical more then making an new one (depending on the amount of retooling). Very interesting stuff. 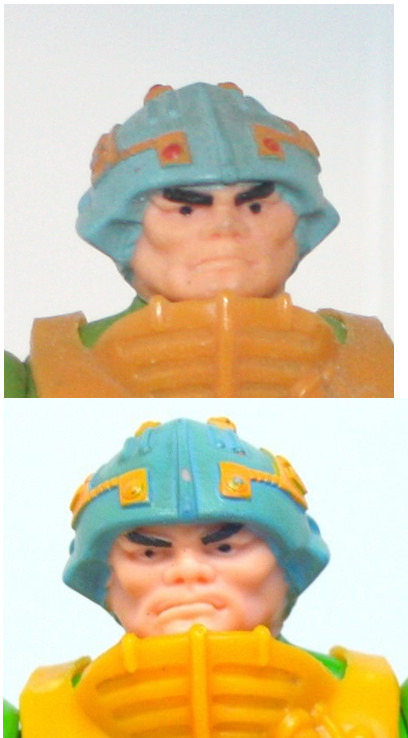 I wonder if that had anything to do with the changes to Tri-Klops’ face mold? Of course those changes happened in a shorter amount of time, I think. well, since they often had no moulds made after where the toy came from, Jazz, for example, was issued 1984-1985. wasn’t cast again tell a 87 release which was probably using a different mould cause it was given some minor changes (adding parts, removing parts) then it wasn’t till the 90s the mould was used again, so kinda less usage then a lot of the MOTU figures seamed to have, also the quietly of the moulds and storage also matter. 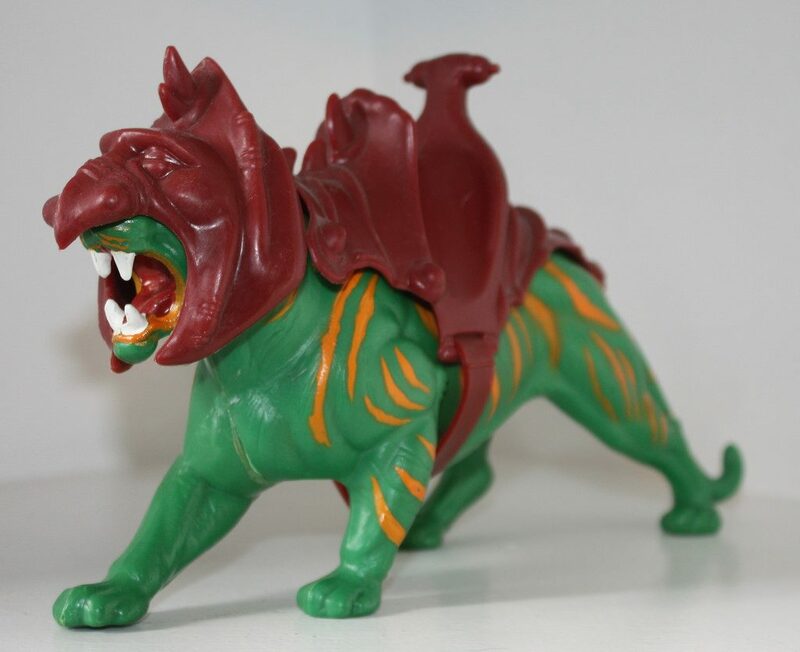 I think, if I remember right, a lot of MOTU figures had pretty long shelf lives, where the average transformer had 1-2 years (some were lucky and got more) before the late 80s where shelf life was changed from being a good thing to keep popular toys on the shelf, to “It’s a sign that the toys aren’t selling well that year old toys are still on the shelf”. You mean the bubble on his chin? 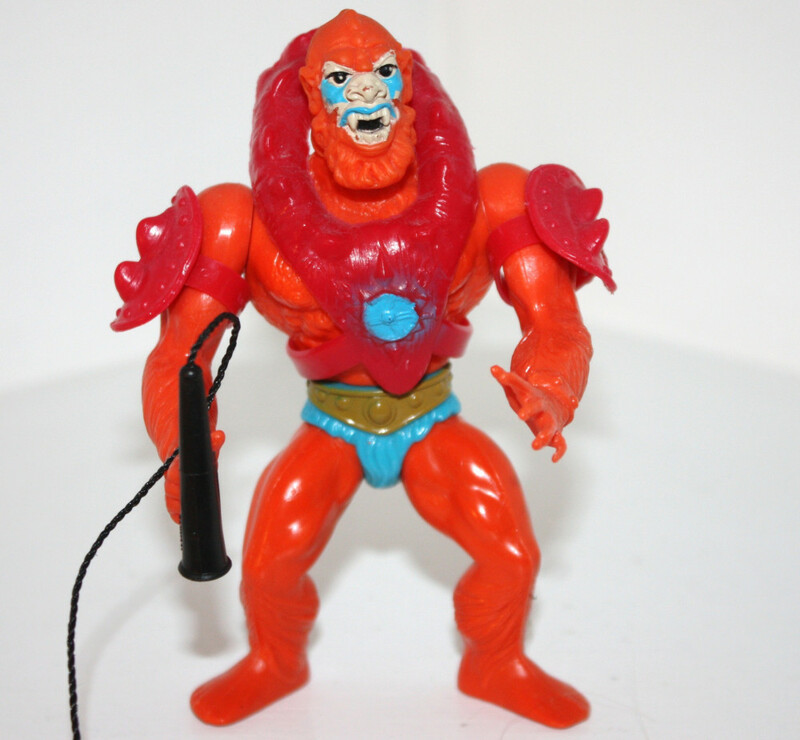 It does look odd, but I’m not sure why anyone would bother to make a knock-off of a Beast Man figure – that would cost more than simply buying a nice mint loose figure. If someone were going to pull a fast one, it would be with that card. Figures on first edition cards (no warranty, no SKUs) are very valuable. Wow, I love this kind of detailed research. Great work! There is a wealth of info here. Reading over it I’m trying to place which versions I had way back when I was 5. 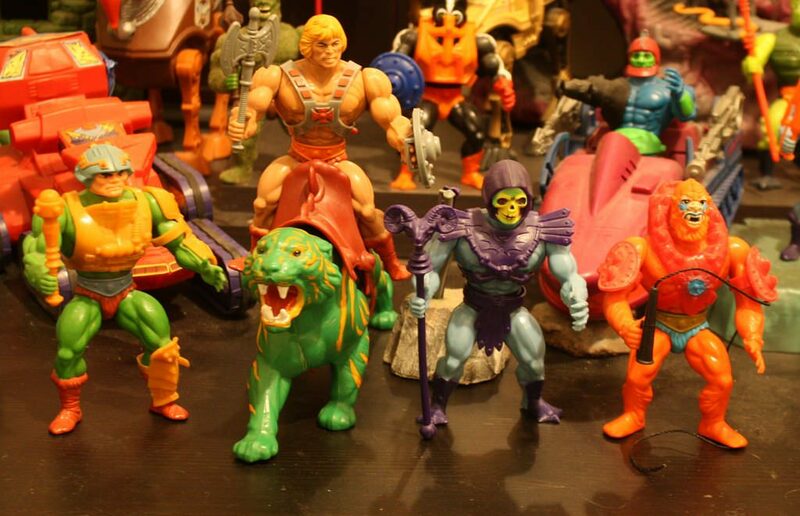 I definitely didn’t have launch Skeletor as mine always had the full painted boots. Though I had a friend who did have the half painted boots, and we always thought it was weird. 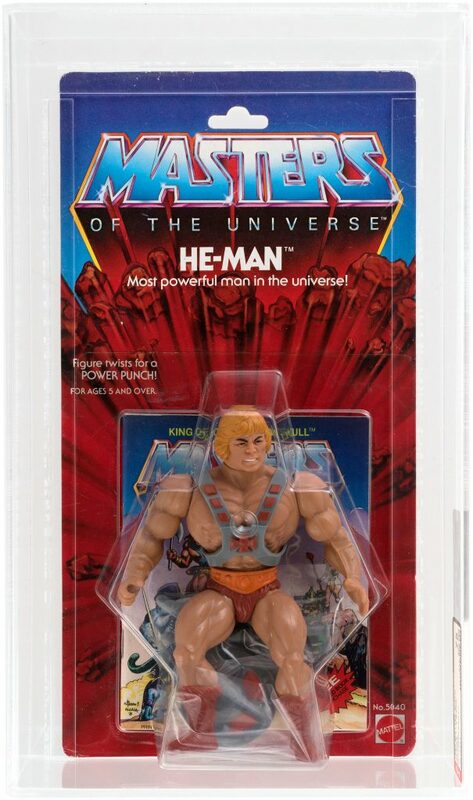 I think I probably did have launch He-Man as I remember seeing commercials for him, and being blown away, when I was 4. I had most of wave 1 before the toon was even on TV! I don’t know that they were all launch versions though. I’m sure many of the running changes happened pretty quickly between one another. Are the MOC toys in the photos yours? If so color me jealous. 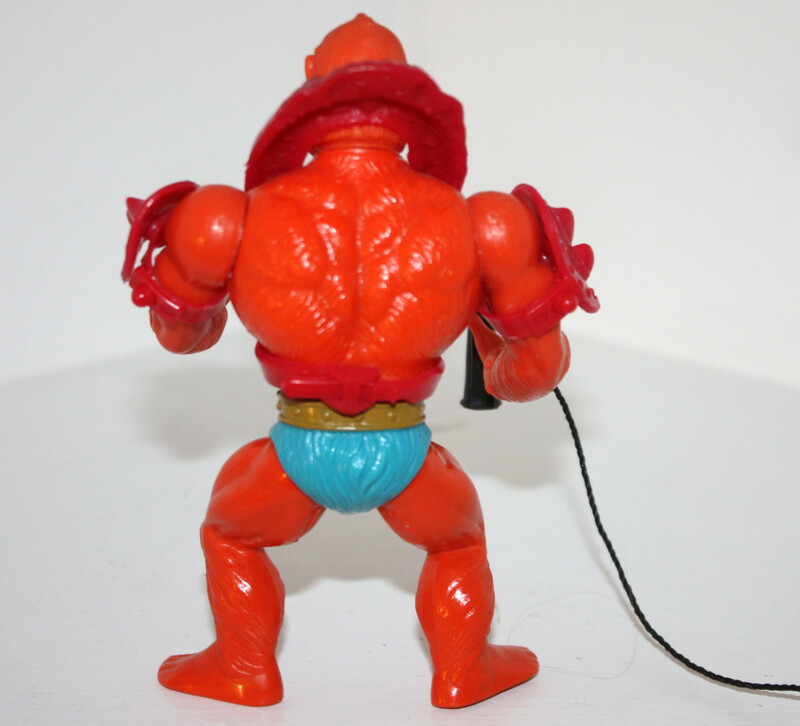 I was fortunate back around 96 to reclaim a carded Thunder-Punch He-Man. Card is not the best, but I’ve never opened it. Pretty much the crown jewel of my humble collection, as it’s the only vintage MOC I have. 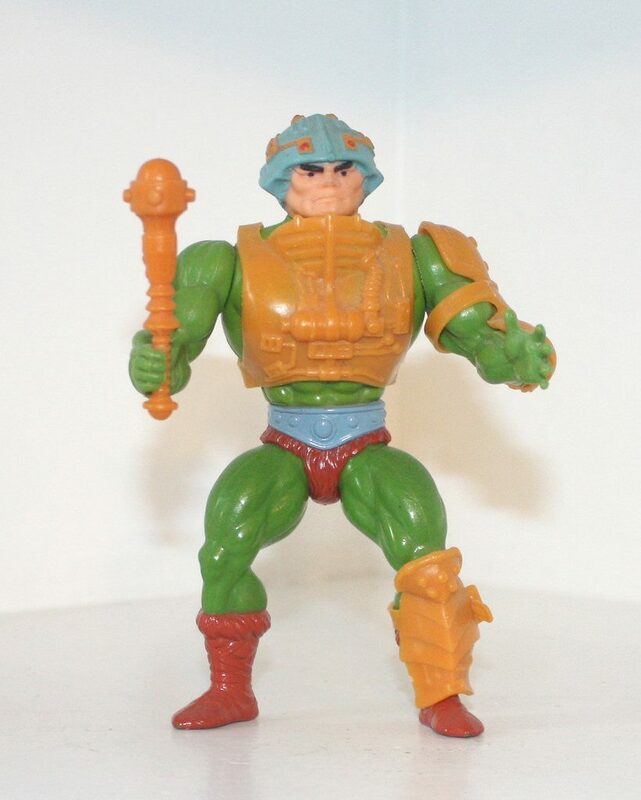 Anyway, as always, you’re a wealth of MOTU info! Thanks very much! Sadly I don’t have any MOC vintage figures. Those photos came from Hake’s Americana (auctions). The loose figures are mine though. I feel fortunate to have them. 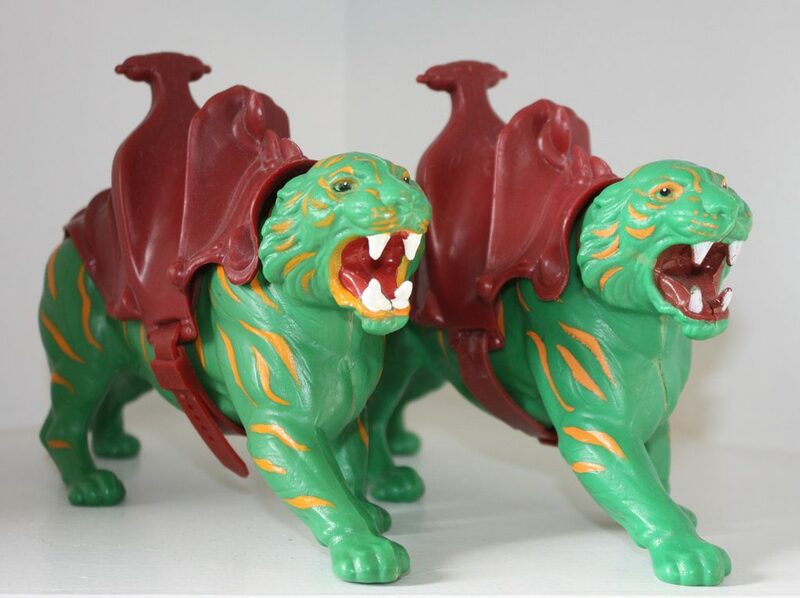 Growing up, I had the V1 versions of all the figures mentioned here except Battle Cat. I think that’s part of why I prefer them now. Thanks for the kinds words! This is handy, as I meant to do a bit of research and determine exactly which releases I had of my vintage MOTU figures. Just never seemed to get around to it these past couple of decades, heh. Having it all in one place, I’ve really got no excuse to put it off any longer. Seems most of mine are first releases, though a couple of them have armor from later releases that are not original to those figures. I’d never noticed the navel before, oddly enough. Now I can’t un-see it on any of them! 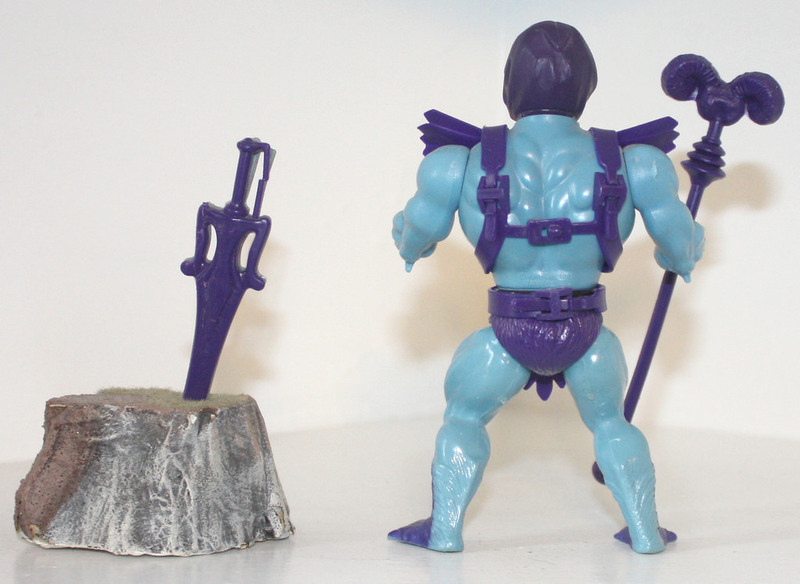 I have one the very early versions of Skeletor with the purple underwear. The sad part about my figure is that the weapon holding hand could never hold any weapons.